From childhood Ilya Semenovich Ostroukhov had a keen interest in the flora and fauna. Day after day, he collected and collected unusual finds of nature. Only at college age, Ostroukhov took up the brush and wrote the first landscapes that as a naturalist he could find. 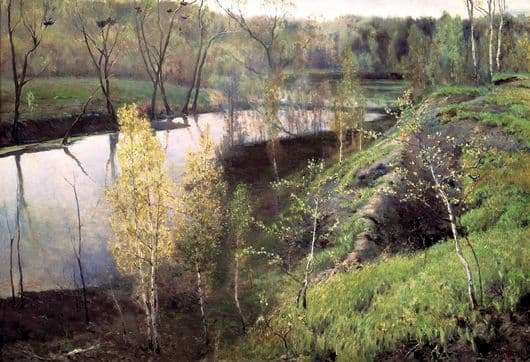 The artist followed the example of Repin, Shishkin, but did not try to repeat them. Without any dramatization and melancholy, he created natural pictures, full of life and soul. Many artists and poets sought to convey the beauty of their native land. In the picture we can easily recognize the nature of the Moscow region. It is mixed all that characterizes Russia, its natural beauty. Spring only announces the arrival of the first greenery of herbs and leaves, which are still a little yellow. In place of the bitter cold with a hint of sadness, comes the joy of a new life. So far only bare trunks of birch, aspen, spruce trees of this mixed forest are visible. Water conveys to the contemplator not only peace from the awakening of nature, but also a reminder that the summer is not soon and the cold has not yet receded. There is a feeling that a person among this world is only a contemplator who can only observe and admire the fullness of life and the wonders of nature. The picture represents the traditional Russian landscape, where coolness and silence reigns in the morning. The sun is already touching the rays of grass and leaves. The snow has already gone, and the river begins to fill, but for the time being, islands of earth are visible, on which sprouts make their way through barely noticeable points. On the branches of trees are already woven nests, which will serve as home to birds. Among the grass you can see a few color strokes, meaning flowers. The artist uses few colors, but fully conveys the feelings that he himself experienced after seeing this beauty. Simplicity and naturalness – this is the main feature of the picture, which occupies not the last place in the Russian gallery.